← Prophecy is unfolding. Here is how you can be a part of it!! My wife sent me a pic the other day (at left) of a cool item she wanted me to make for Hanukkah. As soon as I saw the pic, I added it to my to-do list. 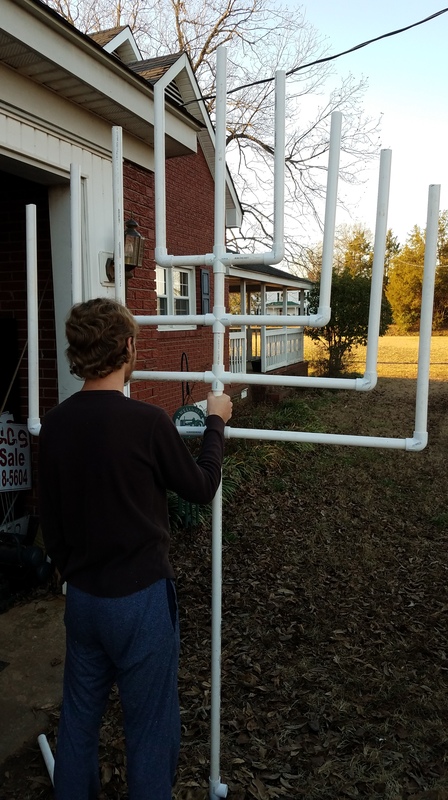 Well, I just got back into town today and picked up some supplies, so Jeremiah and I whipped this up, but we need good weather tomorrow to paint it. What is it?? A yard hanakkiah (though, the pic Kelly sent me is technically a menorah). As the picture to the right demonstrates, ours has nine branches. It is made of 1″ PVC pipe and various fittings. Including the solar lights and extra spray paint, I think we have about $90 in it. We chose not to glue any of the vertical joints, so it has great stability while being able to be disassembled for storage. I’ll add pics of the completed project to this post after we finish it tomorrow, but I wanted to share in case some of you need a cool quick project for the next couple days. First day of Hanukkah is December 24th, a particularly late start date for the eight day latke and doughnut celebration of the Maccabees’ liberating and cleansing the Temple. 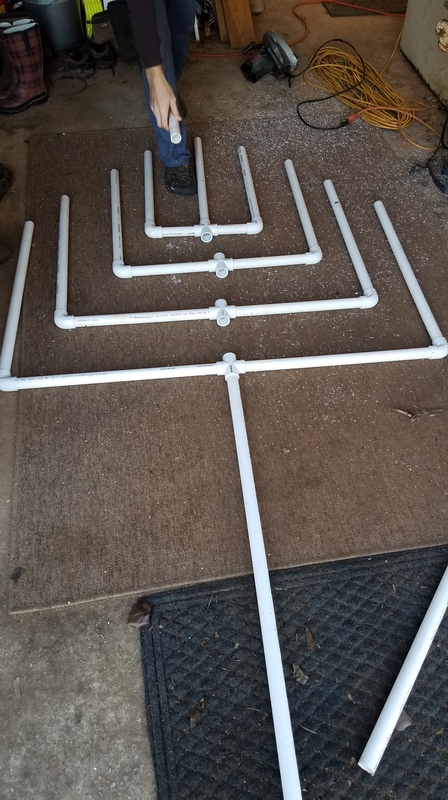 So, you have time to whip one up for your front yard… I plan to go ahead and light with all nine lights from the first night. If you make one, send me a pic!! 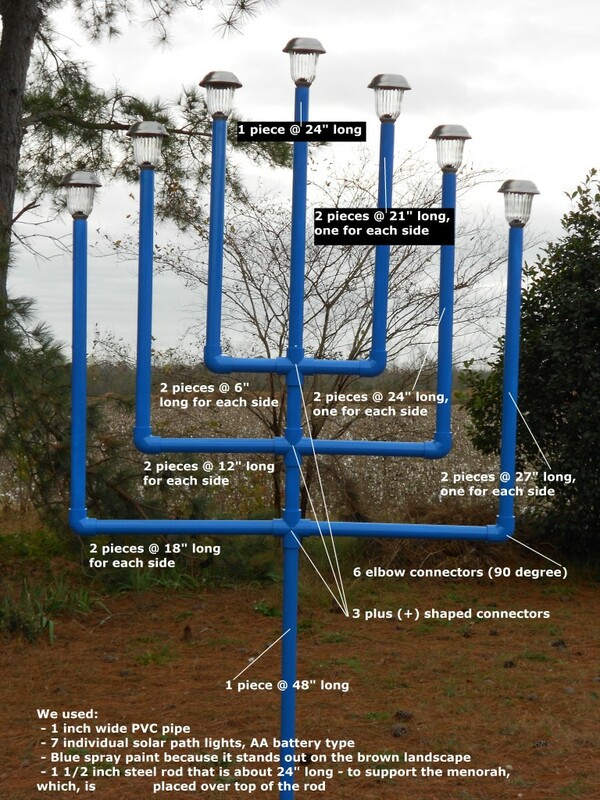 This entry was posted in Holidays v. Feasts and tagged diy hanukkiah, fun project, giant menorah, hanukkiah, lawn ornament, Maccabees. Bookmark the permalink. Glad Geneva is doing well. Sorry we had not heard of your travails. Will keep you in peayer. Thanks! Appreciate all the prayers for sure!! He is doing amazingly well! Some little “signs” along the way helped to encourage him…like the names of some of his nurses…”Angel,” “Blessy,” “David,” “Daniel,” “Isaac!” The first day in ICU a “scripture” quilt was given to him by the American Legion from Blessing, TX! Anyway, we’re both glad to be home! Happy Hanukkah to you and Kelly! My sons and i will get on that right away for sure. Thanks for the great idea. Shalom ! We may make a small one for inside. Handy tip, to recharge those lights in the sun, flip a milk crate upside down and the little poles drop right in. Perfect holder.